100% Hot Wheels. We have looked at the car carefully and do not see any blemishes with the naked eye. Color: Red with White Stripes. Display case has minor surface wear. Add this Die-cast to your Collection! 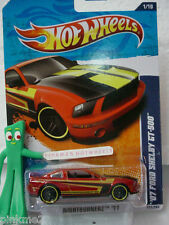 LIMITED EDITION 1 of 15,000 2003 Hot Wheels Drop Top Series 3 of 4 Shelby Cobra 427 S/C Black Real Riders Tires (BOX1). Hot Wheels Classics Series 2 Gold Shelby Cobra 427 #20 of 30; FREE S/H! It is #20 of 30 and has the Goodyear 7 spoke wheels. It is gold in color. Car in mint on near mint card. Blister has no nicks or creases. COBRA 427 S/C REAL RIDERS. HOT WHEELS. condition mint to near mint. Year issue: 2017. '67 Shelby GT500 Mustang. Hot Wheels Limited Edition. Hot Wheels Exclusive. A set of 5 Hot Wheels 1:64 Car Culture Circuit Legends (Set of 5 PC). 1x Porsche 962. 1x Mazda 787B. 1x '16 Ford GT LM. This car set includes the following cars Set of 5 INCLUDE THE FOLLOWING. Color: Assorted. 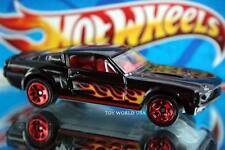 Hot Wheels 67 Shelby GT500 Coupe- 2012 Shelby 5-Pack Exclusive - Loose. Condition is Used. Shipped with USPS First Class Package. Hot Wheels Special Edition Cars. Hot Wheels Special Edition Car. 1965 SHELBY COBRA DAYTONA COUPE, Blue #15, Hot Wheels 1:64, NEW in Box! SHELBY COBRA DAYTONA COUPE Limited Edition - Out of Production Hood opens - Detailed engine - Detailed interior - Real Rider rubber tiresDisplays well - Will compliment any collection - only displayed never played!Includes display case NEW in Box / THANK YOU FOR LOOKING Limited edition. Box is not perfect. See pictures. Item in pictures is exactly what you will get. I will ship in a box with care. No envelopes. Please ask any questions before you bid. This is from my own personal collection. Limitations on. WAIT FOR the INVOICE! NOTE: Car's color will change based on room temperature. UPC#: 746775345716. FORD SHELBY COBRA CONCEPT #4. Mystery Car Series. 2009 HOT WHEELS. Super SHARP! This car also features sweet white s triping and the Shelby Cobra logo along with "GT 500" written on each front quarter panel! This is an asolute BEAUTY! Amazing details! 2010 Ford Shelby GT500 Super Snake. They only made 7500 of these beauties and this is serial number 3170. Una vez finalizado solicite su factura por todos los ítems. HOT WHEELS. IN ORIGINAL BLISTER. CHEVY CAMARO CONCEPT - FORD GTX1 - DATSUN 240Z. HOT WHEELS 2007. condition is mint to near mint condition. MINT CARS IN EXCELLENT PLUS BOX LIGHT SHELF WEAR. 1965 FORD SHELBY GT 350 LIMITED EDITION PAN-AMERICAN RACE CAR 1/64 M2 HOT!! #040 ~ Shelby Cobra 427 S/C. 2000 Speed Blaster Series. Hot Wheels. FORD SHELBY GR-1 CONCEPT. 2008 MYSTERY CAR. dark green with silver stripes. Never played with. Collector # 406. 1996 Hot Wheels Series Car. Hot Wheels 1996 series die-cast vehicle. This item is on aFULL length nearmint to excellent condition card. Series: Sports Car. Wheel type or style: 7 spoke. Year issue: 2018. '67 Shelby GT500. Hot Wheels Exclusive. Hot Wheels Limited Edition. Sealed on Card - Hot Wheels - Muscle Mania - '67 Shelby GT-500 (Red) #1 of 10. These are new on unopened cards inside protecto-paks. Includes the Dodge Viper, Custom '62 Chevy, and the Ford Shelby GR-1 Concept Car. ITEM:HOT WHEELS FATBAX SHLEBY COBRA 427 S/C #112. BIN #6-0005. TYPE: 2005 Crazed Clowns II 2/5Die-Cast Car. NOTES: MINT ON CARD - COMPLETE. 2018 HOT WHEELS 50 YEARS. CAR CULTURE CIRCUIT LEGENDS CASE E.
Vehicle from 1st run tool. Super SHARP! This car also features sweet blue on blue s triping and the Shelby Cobra logo along with "GT 500 - Super Snake" written on each front quarter panel! 2010 Ford Shelby GT500 Super Snake. (They won't have this! ).